It’s time for another hoppin’ adventure! 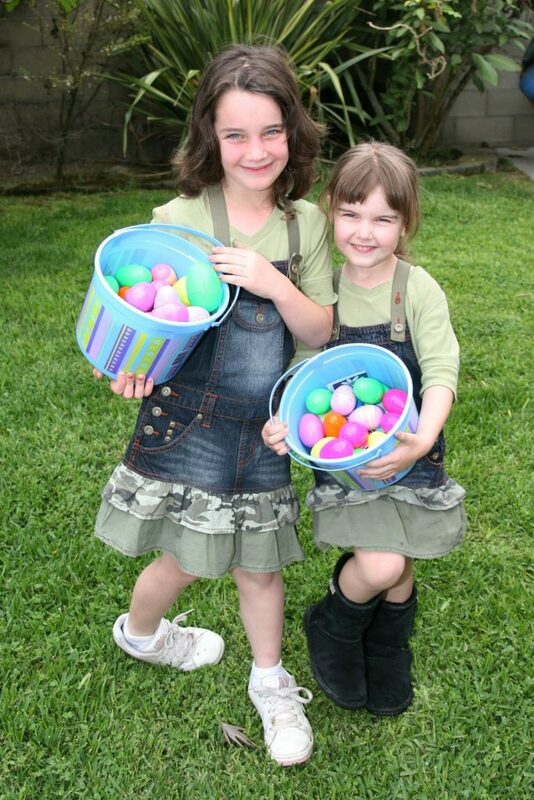 The Easter Bunny will be visiting Sycamore Terrace Temecula Apartments once again to hid eggs all over the place! Help us find them all at our Annual Easter Egg Hunt. Join us at the Sand Volleyball Court this Sunday, April 14, at around 11 AM to 12:30 PM for an exciting afternoon! 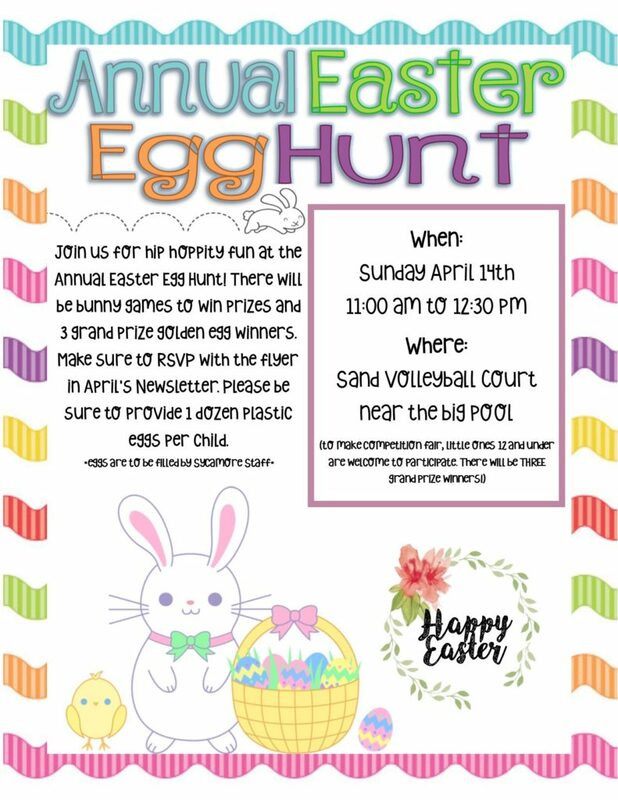 Sycamore Terrace Temecula Apartments continues its long tradition of the Annual Easter Egg Hunt, and, like we do every year, we’ve prepared another amazing Easter celebration for all residents! To keep it fair, we’re keeping the Easter Egg Hunt exclusively for our little residents aged 12 and below. Please remember to provide one dozen plastic eggs per child that will be filled by your friendly Sycamore Terrace staff. Golden Egg winners will go home with special prizes from the Easter Bunny with loads of goodies and treats in a nice basket. On top of the Easter Egg Hunt, there will be all sorts of thrilling games for everyone to enjoy. Show off that bunny energy by joining the egg toss, bunny hop races, spoon-egg races, and more! Of course, winners get prizes! It’s going to be so much fun, so RSVP as soon as you can, using the flyer in our April newsletter! Say Hello to Your Neighbors! Our Easter Celebration is also your chance to meet and greet your Sycamore Terrace neighbors. At Sycamore Terrace Apartments, we love nothing more than to see our residents laughing together, striking up good conversations, and starting lasting friendships in our beautiful community. Fostering a strong sense of community is why we go above and beyond to come up with celebrations for all of our residents to enjoy together. Aside from the annual Easter Egg Hunt, we hold festivities for special occasion throughout the year such as Valentine’s Day, Halloween, and Christmas Day. Once our Easter party is over, you can spend the rest of the day with our numerous amenities. Play catch on our green lawn, have a picnic at a shady spot, and cool down for a swim at our big pool. Form teams with fellow residents and set up a rousing volleyball or basketball game. At Sycamore Terrace Apartments in Temecula, CA, you’ll never run out of awesome things to do! Nestled in the heart of charming Temecula, Sycamore Terrace Apartments offers some of the best apartment homes in the area. Select your new home from our newly-remodeled spacious units equipped with washers/dryers, refrigerators, and other great furnishings. Residents also get unlimited access to state-of-the-art amenities like the Fitness Centre, Swimming Pools, an expansive Outdoor area, and more. For all questions, please call us at 951-878-5386 or come over for a visit and see our incredible apartments for rent in Temecula, CA!